“What goes up must come down,” is an idiom dating to the 1800s describing the inevitability of gravity. It is also a fundamental concept in finance; anything elevated artificially without fundamental support will eventually lose altitude. Economies have a tendency to correct imbalances and return to equilibriums in the longer run, irrespective of the short-term measures introduced to overcome those forces. The Chinese economy may currently be living this lesson. China has enjoyed over three decades of soaring growth thanks to the tailwinds of expanding global trade and the helium from government-financed investments. 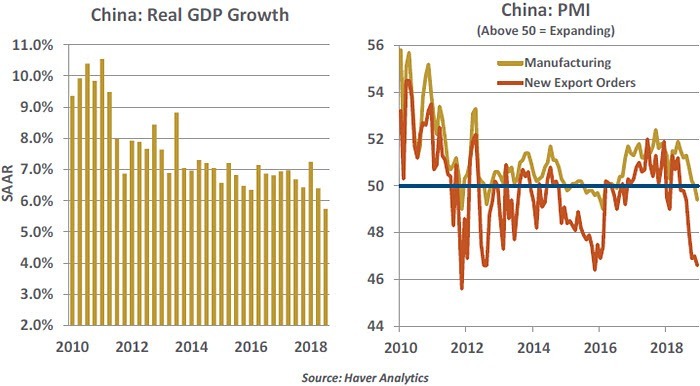 But recent signs suggest that China is struggling to sustain economic momentum, and risks of a hard landing are rising. If China falls back to earth, we will all feel the tremor. The slowing of the Chinese economy is apparent across a broad range of indicators. Quarterly growth in real gross domestic product (GDP) fell below a 6% annual pace for the first time since the financial crisis. The manufacturing Purchasing Managers’ Index fell below 50 in December, registering a first contraction in nearly two years. (Export orders, in particular, were very weak.) Given Western suspicions about the manufacture of Chinese economic data, the situation could be worse than the numbers suggest. Chinese households, whose incomes have expanded considerably over the last decade, are holding off their spending amid rising uncertainties. Retail sales, which have grown at a double-digit pace consistently since 2008, recently recorded their lowest growth rate in over 15 years. Auto sales declined for the fifth straight month in November and now stand 14% below where they were a year ago. Chinese consumers are struggling to pay off their credit cards, with delinquencies up 33% year-over-year. Reflecting all of this, the Chinese equity markets performed very poorly last year, in both absolute and relative terms. There are those in Washington who will claim these developments are the product of trade restrictions, but there is much more at play. Two years ago, the Chinese government began a drive to scale back leveraging. Wealth management products (WMPs), opaque financial instruments used to finance housing and small businesses, were a particular target. Year-over-year growth in the issuance of WMPs fell from more than 50% at the end of 2015 to zero at the end of 2017. Financial reform was badly needed, but took the expected toll on economic activity. Industry profits, which until 2017 were growing at a double-digit rate, have trended into negative territory over the last few months. Home sales and home prices are advancing at a much slower pace. The current trade frictions have made the situation more challenging. The United States has galvanized international support for its push against Chinese trade practices and expanding tariffs are taking a toll. Negotiations have been more active, but agreements are still some way off. The weakening of economic indicators has compelled policymakers to respond by using familiar stimulus tools. China’s government has reduced taxes for individuals and small businesses, and the Chinese central bank recently announced yet another cut in required reserve ratios for banks. China’s planning body, the National Development and Reform Commission, has approved new rail projects worth a total of RMB 860bn ($125bn) covering eight cities and regions since December 2018. An increase in project approvals is a reversal from its earlier stance of abruptly cancelling various subway lines in an effort to curb the rapid growth of local government debt. All of this adds up to a broad retreat from the program of financial reform. By doubling down, however, the Chinese risk problems with financial stability in the years ahead. Should these efforts falter, the effects of China’s slowdown will be felt globally. China is commonly referred to as the world’s factory, but has also emerged as a key purchaser of several consumer and luxury brands due to its rising middle class and their growing purchasing power. The slowing of the German economy, which barely grew in the second half of 2018, is clear evidence of this. Weaker Chinese demand has started weighing on electronics manufacturers (such as Apple, which has attributed a drop in revenues to Chinese deceleration) and oil producers (as China is the world’s second largest consumer of oil). These consequences are unpleasant, but they would pale in comparison to what might transpire if China’s financial system cracked. A 2008-style meltdown would have its biggest consequences in China (almost all Chinese debt is domestically held), but the shadow it would cast on global markets would be long and dark. 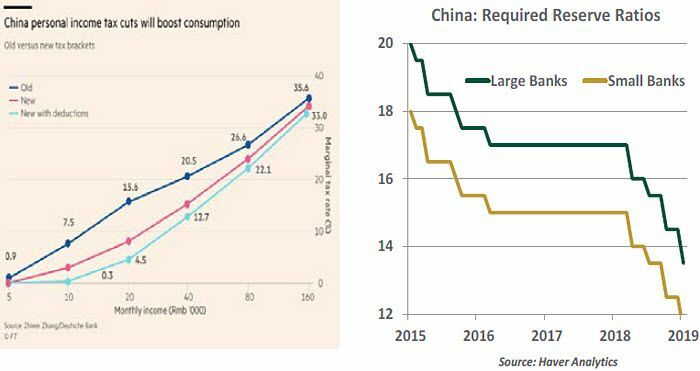 Recent fiscal and monetary measures suggest Chinese policymakers are concerned about the health of their economy, and they do have considerable resources at their disposal. The government’s ability to manage information and investor sentiment also reduces the risk of panic. But turning away from reform and returning to old ways will only amplify structural problems in the long term. The time has come for China to move away from the ethereal economic model they have embraced during recent decades and accept one that is better grounded. The trick in the process is to engineer an orderly descent. As expected, the exit arrangement that British Prime Minister Theresa May had negotiated with the European Union (EU) was defeated in the parliament on Tuesday evening. The question remains: what comes next? The decision tree of possible paths has many limbs. They include a new government (very unlikely), a second Brexit referendum (not very likely), and a renegotiation with the EU (stay tuned). Despite the protestations of the Prime Minister that the U.K. will depart on schedule at the end of March, each of these possibilities would likely require an extension of the timeline. From one perspective, sticking to the timeline has value. Britain wasn’t clear on what kind of relationship it wanted with the rest of Europe when the referendum was held. Thirty months later, the uncertainty persists. As Ms. May stated after the defeat of her proposal, “It is clear that the house does not support this deal… but tonight’s vote tells us nothing about what the house does support.” A deadline can be an avenue to clarity, and action. Furthermore, the lingering uncertainty continues to take a toll on the British economy. Production in the U.K. is slipping, and talent is leaving the country. The risk in sticking to the deadline is arriving without a plan. We’ve discussed the disorderly “no deal” scenario in the past, and it isn’t any prettier now. 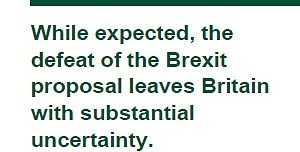 We await updated proposals for Brexit, with the next series of votes in parliament following at the end of the month. Interestingly, the value of the British pound rallied after the proposal was defeated. Currency traders apparently saw a clearer path to a softer Brexit or no Brexit at all. I wish I shared their confidence. “Tighter financial conditions” is a recurring theme in the financial press. The phrase is used freely, often without any explanation of what financial conditions are and why they are changing. Financial conditions evidence how easy or difficult it is to obtain financing. Capital comes through many channels: Consumers can take out loans from banks; businesses have additional options like issuing bonds and raising equity. These mechanisms almost never run dry, but their costs and availability will vary over time. Terms like strict, tight, or rising financial conditions are shorthand for an environment in which it is more difficult to raise capital. Credit spreads, measures of the difference between the yields paid on debts of two different levels of risk. Most often, the yield of a risky asset is compared to the yield of a U.S. Treasury bond of similar duration, as Treasury debt is nearly risk-free. As lending risks rise, high-yield investors will expect greater compensation for risky assets. Volatility. Increased volatility is a signal of market uncertainty, often a reaction to economic surprises and negative news. During these times, investors will often take a risk-off position, reducing access to capital. Bank performance, both in their lending behavior and their stock prices. The Federal Reserve routinely surveys senior lending officers to ask whether their banks are raising or lowering their underwriting standards and prices for loans. This is a direct indication of the ease and cost of obtaining credit. Meanwhile, bank stock prices are tracked as a proxy for the performance of the financial sector; in a thriving economy, bank stocks will rise. Equity prices. As financial assets grow in value, investors experience a wealth effect, finding themselves with more capital to spend and invest. Companies seeking to raise funds will have an easier time in a bull market. The U.S. dollar’s value. A stronger dollar typically coincides with higher interest rates that raise the cost of borrowing. Exact components and their weightings vary within each index. An index may contain just eleven indicators (as in the Kansas City Fed’s index) or more than 100 (like the Chicago Fed index does). Returning to today’s mantra that conditions are tightening, we see that each of those components is changing in a way that leads to stricter conditions, though most indices remain below the level they consider restrictive. A confluence of market dynamics drove this shift. Some of the change is simple reversion to the mean. Late 2016 and all of 2017 were a quiet span. For perspective, the VIX equity volatility indicator set a record low reading of 9.1 on November 3, 2017, and no day in 2017 had a reading above 20. In contrast, the volatile month of December 2018 saw an average daily VIX reading of 25. The recent change in conditions has been less of a correction and more of a return to normal levels of volatility. 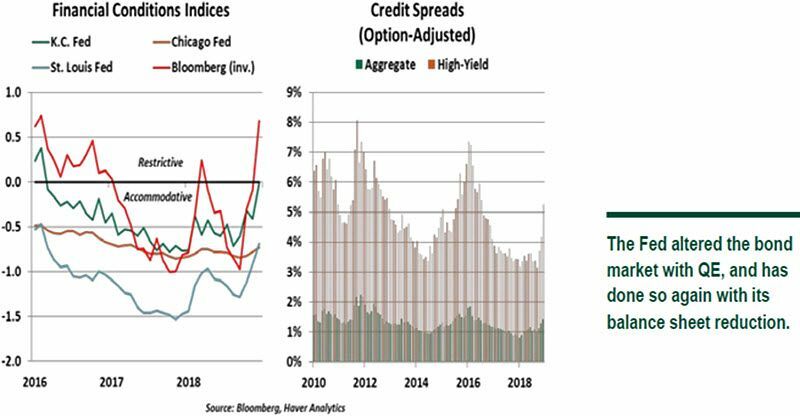 Higher rates are tightening conditions, as well, by raising the cost of debt financing for corporations as well as the cost of funds for banks. Rate actions are thus a difficult balancing act for central banks that require weighing the role of debt in economic growth against the potential that cheap credit will overheat the economy. The Fed’s most recent rate movement sparked a loud market response, a sign that rising rates are beginning to put upward pressure on firms’ cost of capital. Higher corporate leverage is a factor, as well. In the recent buildup of corporate debt, issuance was concentrated on the cusp of investment-grade and high-yield bonds. As corporations become more levered, they must prioritize maintenance of their credit ratings; their ability to take on more debt will be constrained, an impairment to raising capital. Lastly, the Fed’s balance sheet reduction may be driving market movements. Quantitative tightening has changed the composition of the bond market. When quantitative easing was in effect, the Fed bought much of the market’s supply of low-risk bonds, pushing investors into higher-risk classes. As these bonds are paid down, there is a greater supply of government debt available for sale, as the Fed’s purchases have ended. Investors who may have purchased corporate debt in the past are now considering government debt, especially as rising rates are putting more attractive yields on offer. Financial conditions tend to move in line with the economic cycle. We expect the end of the Fed’s rate movements is in sight, which should help reverse the recent increase in conditions indices. However, financial leverage takes a long time to pay down, and volatility is returning to its long-run norms. The movement to tighter financial conditions felt abrupt, but it was a quick leap to a new steady state.